This unconventional emotional music will show you a different world - world of dark fantasy, ancient civilizations, druids and gods. Its atmosphere will get you into a very strange but very interesting dream. This unconventional emotional music will transport you into a different world - world of dark fantasy, ancient civilizations, druids and gods. Its atmosphere feels like a very strange but very interesting dream. A combination of special ethnic instruments (such as jaw-harp, didgeridoo), deep vocals (and throat singing), gentle female soprano and haunting tones of acoustic guitar evokes extra-ordinary vivid images and feelings in the listeners. It is even enlarged by the fact that the vocals do not contain any known language and therefore seems to be somehow prehistorically distant and inexplicably familiar at the same time. Yeah, that's really something. I have this album for about two weeks and I totally love it. It was the first time I've heard throat singing. If you like something really different, nostalgic, magic, dark.. like Dead can dance. You'll love it! Nemuer is a very unique project which is difficult to describe. It's genre name would be something like "dark fantasy acoustic folk music". 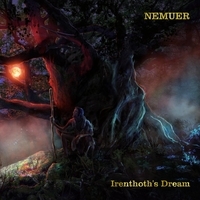 However, this description is by far not enough to describe Nemuer's first full-length album Irenthoth's Dream. Imagine vikings, druids, Egyptian gods and an atmosphere so dense, dark, ominous and eerie that it could easily be soundtrack to H.P.Lovecraft's stories. Mix all of these things together and take just the essential core of it all. Then you might be close to what Nemuer is. As some fans have already said: "Metal without Metal". Nemuer's music is essentially very minimalistic and at times almost ambient. Most of the time you can hear just acoustic guitar and lyric-less vocals of Nemuer himself. Rarely the male vocal is joined by female vocal or jaw harp, courtesy of Katarína Pomorská. Even with this minimalism the music contains a varied range of atmospheres that change in such a way that you can imagine the story the music is telling. This music will most likely not captivate everyone, but if you like unusual musical experiments or any of the above mentioned elements of which this music consists, you should definitely give Nemuer a listen.